As a result, internationally known and acknowledged professionals have summarized their experiences on talent and talent support in a book with the title "Providing for Special Needs of Students with Gifts and Talents". The book was published in November of 2017 by the Centre for Talented Youth Ireland (CTYI) Press. The studies focus on curriculum development, environmental impacts that affect the development of talented students, out-of-school talent development, networking opportunities for the gifted, motivation and experiences with students coming from low income families. Editors of the volume, Jennifer Riedl Cross (USA), Colm O'Reilly (Ireland), and Tracy L. Cross (USA) sought to get a global picture of international talent management in the book. In the preface of the book, Professor Deborah Eyre sums up the most important sayings of the studies and commends the authors' writings. In the first chapter of the book, Albert Ziegler, Heidrun Stoeger, and Daniel Patrick Balestrini present Ziegler's "Actiotope" model for conceptualising giftedness. Nowadays talent models are increasingly differentiated and in many cases contradictory. Ziegler's approach is modern and comprehensive. He suggests that we need to look at the individual, his or her environment, and most importantly, the way the individual interacts with his or her environment. In the second chapter we find an interesting study about inclusive education by Margaret Sutherland and Niamh Stack. The chapter highlights the important inclusive attitude that the school considers the student as an independent person in his or her complexity (including his social, cultural, and individual abilities). Differences between children in education are seen as an opportunity rather than a barrier. Csilla Fuszek, emphasizes how important it is for talents to find the right supporting environment and explains the importance of networking on the way to success in the third chapter. The example of the Hungarian National Talent Support Network provides an excellent case study of how from a small start a full network can grow and expand. In the fourth chapter an interesting good practice is introduced by Colm O'Reilly, Amy L. Shelton and Antonios Apostolou. Talented students coming from different parts of Ireland are selected to the program run by CTYI (Center for Talented Youth Ireland). 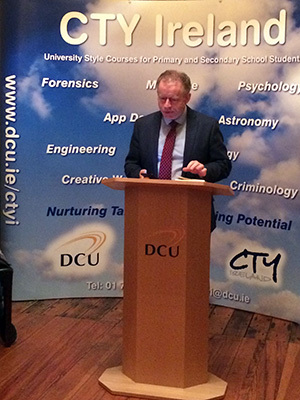 The talented ones are provided challenging, university-level education within the walls of Dublin City University. Chapter 5 deals with young gifted children and early childhood education. Nancy B. Hertzog has been researching this field for many years. In this chapter, she starts with the importance of teacher beliefs and the subsequent creation of a positive and challenging classroom culture before moving on to the programming aspects. Nancy describes critical thinking as the key to providing challenging and meaningful learning opportunities for all young children, including advanced learners, and outlines what that might look like in practice. The author of the sixth chapter discusses the development opportunities of disadvantaged talented students. This chapter provides a case study of "Camp Launch", an university based program, which offers challenging learning opportunities for low income students. Chapter Seven is written by Jennifer Riedl Cross and Tracy L. Cross. 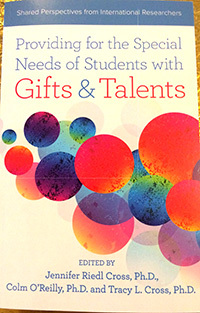 The American authors give an excellent summary of the main issues and challenges associated with students with gifts and talents. Issues of anxiety, depression, suicidal tendencies, and mental illnesses are discussed. The second part of the study deals with the role of parents, siblings, friends, advisors in the positive psychological development of the children. The last chapter addresses the key question of motivation. As Mojca Juriševič suggests, learning potential demands sufficient time and perseverance, as well as quality experience and knowledge, which the student can only acquire with years of active participation in a particular field. This chapter looks at the findings from five empirical studies undertaken in Slovenia. In summary, the volume of studies published by CTYI is useful and interesting. Parents, teachers, psychologists, as well as talent developers can get exciting and valuable information on research results and get acquainted with some successfully run talent support initiative.